While we wrote heavily about CES on our Gadgets channel here at TNW, what we mainly wrote about were the products on the floor. But if you want your product to stand out, you really have to do some incredible work at CES. In the world where “booth babes” and pounding music are the norm, maybe the best answer is to make the world feel like they’re right there with you. Feeding to our addiction with checking in and being social, Intel partnered with JESS3 to bring in data from a variety of sources and then make it look incredible. Twitter, Flickr, Foursquare, Gowalla and even Facebook Places check-ins were monitored and totaled up for a massive, socially-savvy atmosphere. 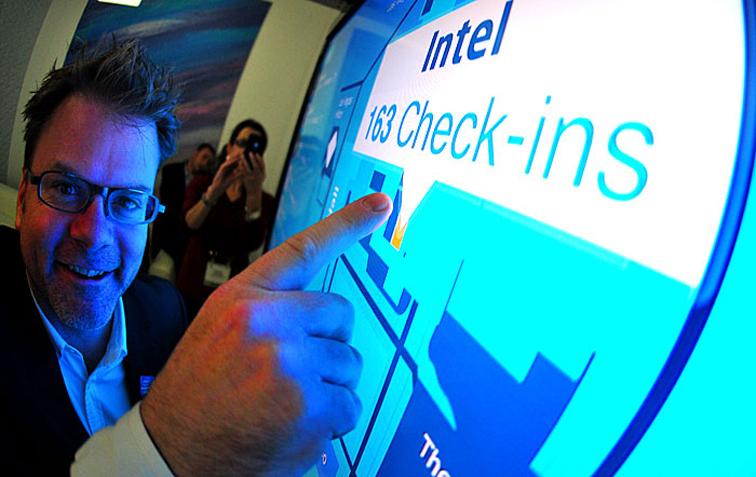 What’s really cool about the installation is the fact that Intel didn’t make it self-centered. By providing information for whatever was trending, visitors to CES could get a real-time view of the latest and greatest announcements no matter who was making them or where they were on the show floor. It’s an interesting thing to see, when companies break out of the traditionally-understood molds for how social media “must work”. By stepping out and having engaging information, even about products other than their own, Intel set a standard that we really hope we’ll see happen more in the future. Want to catch the whole behind-the-scenes deal? Make sure to check out the blog at JESS3. You’ll see wireframes, early sketches and find out how it all came together to make social media magic in the madhouse that is CES.